We do this through contract negotiation, strategic sourcing and advisory services. IT software is a large area of spend for many companies, yet companies are often being drastically overcharged by their IT software and service providers. We are IT software negotiation experts with proven results generating hundreds of millions of dollars of savings for our clients. We are uniquely positioned to negotiate enterprise, custom, and software as a service agreements with global suppliers. Large firms and corporations like McKinsey, Bristol Myers Squibb, Syngenta and more hire us specifically to focus on their IT sourcing. At The Negotiator Guru, we help you reduce your IT software & service expenses by 15-40%. According to CIO Magazine, an average company spends 3.2% of revenue on IT. ​Another study from Apptio shows that ​40.4% of IT budget is typically spent on software and outside services / labor. 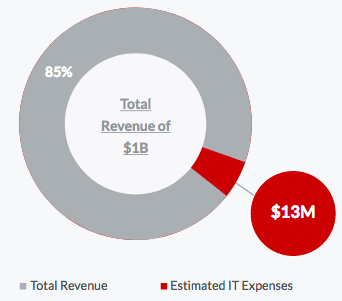 For a mid-market company with $1B in revenue, that means your IT software and services expenses are $13M per year. Interested in reducing your IT expenses?